Lavushi Manda National Park, ZambiaThe current activities of the Foundation for Wildlife and Habitat Conservation - Zambia (FWHC) include a recent acquisition of 15,000 hectares of undeveloped land. A full 5,000 hectors have already been funded. The primary goal for this land is for conservation purposes. This land is rich both in plant and animal biodiversity and more important it is less than 25 kilometres from North Luangwa National Park. This land could provide a migratory corridor for the recovering wildlife populations in the Luangwa Valley - through traditional migratory routes - bringing wildlife back to the Lavushi Manda National Park located up on the top of the Muchinga Escarpment. LVMNP has long since been stripped of its native wildlife and now offers beautiful habitat for wildlife. The FWHC vision for the Muchinga Conservancy is to have a Community Managed Nature Conservancy that is protected and has a thriving pristine miombo woodlands with abundant wildlife species that will be defended and protected by the Community Indigenous Trust. Currently this part of the area is under massive pressure from commercial farmers who want to open the area up for agriculture production. "Another Problem: the influx of newcomers from the south of Zambia, where the living conditions are getting worse, chiefly by the drought. The people migrate to the swamps of the north, among others to the district of Mpika, which offers fertile grounds and enough rain. This is facilitated by the policy of the government, which offers the cheap lease of the plots, very often the forested areas. 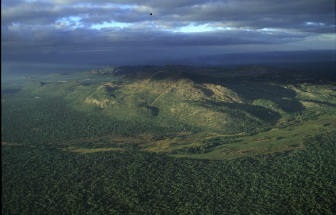 These areas are subsequently deforested and transformed into agricultural businesses. FWHC is seeking financial support to pay for the remaining 10,000 hectors of the proposed reserve.